Delightful rolls of eggplant filled with scrumptious sweet lemon-scented ricotta! 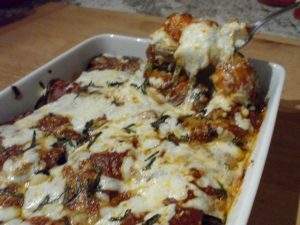 If you want to reduce the calories and fat in this dish, you can omit the olive oil and broil the eggplant until pliable and use either dairy free cheese or lower fat cheese. Place all ingredients, except eggs into a large bowl and mix together until completely incorporated. Taste and correct / add seasonings to your liking. Don’t be afraid of the lemon; it gives the filling a very nice fresh taste. 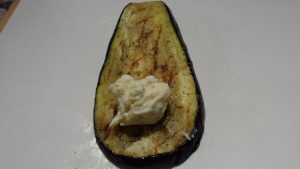 Once you are satisfied with your filling, beat the eggs and incorporate them into the cheese mixture. Choose eggplant that is shiny, firm and without bruises. Wash and dry them. 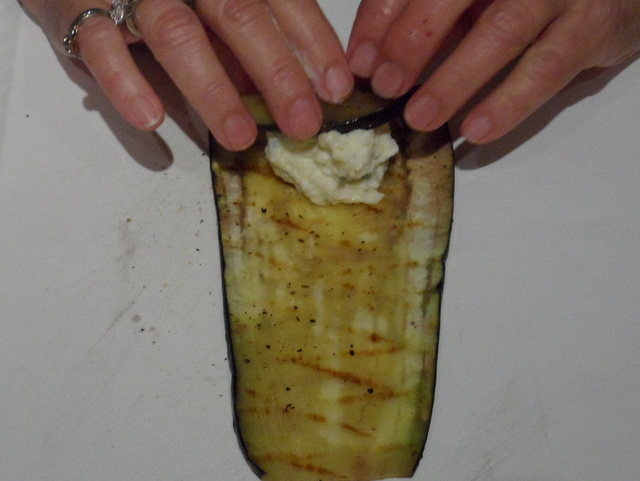 Cut the top (stem) end off and a slice off the bottom as well, so that you can stand the eggplant on end. Slice lengthwise into about just under ½ inch slices, about 1/3 inch or so. 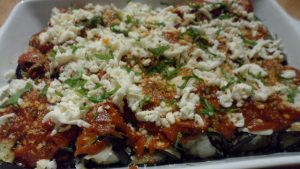 The idea here is that you want to be able to roll the slice once it has been softened, but not so thin that you can’t taste the eggplant. 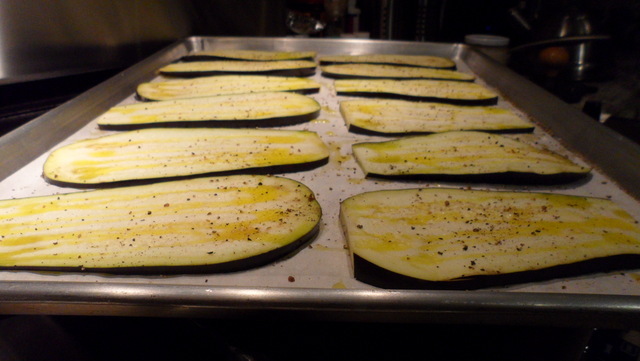 Lay the slices out on a flat surface and either drizzle or brush a little olive oil on each slice, each side. Sprinkle with some flake Kosher salt and grind with freshly grated pepper. 5. My choice is to grill the slices on my outdoor barbeque grill, but you can also use a grill pan, pannini pan (watch this, it will cook quickly!) or a regular frying pan. 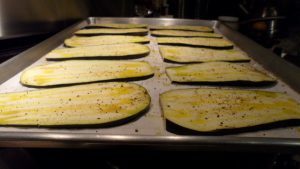 You can also broil the slices if you prefer. 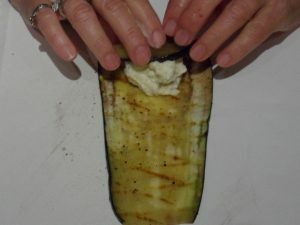 Basically, you want to partially cook the slices of eggplant so that they are rollable, but not mushy. 6. 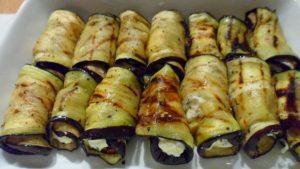 Once the slices are all partially cooked, place a dollop of filling (about 1 Tablespoon) towards the wider end of the eggplant and roll up towards the smaller end. 7. Place rolled and filled eggplant slices into an 8 x 10 baking dish, side by side and touching. You will need to make two rows. 8. 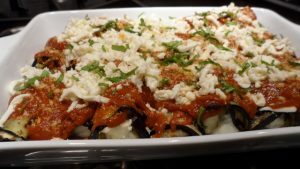 When completed, top with your favorite pasta sauce, sprinkle with a little grated Romano and top with mozzarella slices or gratings. Sprinkle with fresh basil leaf slices, if you like. 9. Bake in a 350 degree oven for about 45 minutes to an hour, or until bubbling hot. Just melts in your mouth!